The papers of Edna O’Shaughnessy are among the finest to be found in psychoanalytic writing. Her work is unified not so much by its subject matter, which is diverse, but by her underlying preoccupations, including the nature of psychic reality and subjectivity, and the psychic limits of endurance and reparation. 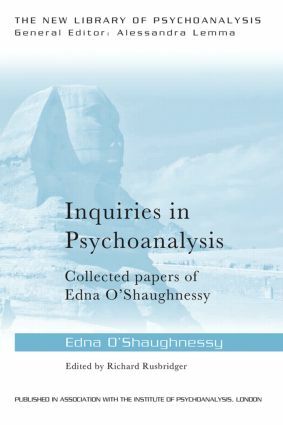 Here a selection of her work, edited and with an introduction by Richard Rusbridger, is brought together in a collection which demonstrates the contribution that O’Shaughnessy has made to many areas of psychoanalysis, from personality organisations, the superego, psychic refuges and the Oedipus complex to the subject of whether a liar can be psychoanalysed. Inquiries in Psychoanalysis is a record of clinical work and thinking over sixty years of psychoanalytic practice with children and adults. This wide-ranging selection of work will be essential reading for psychoanalysts, psychotherapists and students. Can a liar be psychoanalysed? What is a clinical fact? Where is here? When is now?